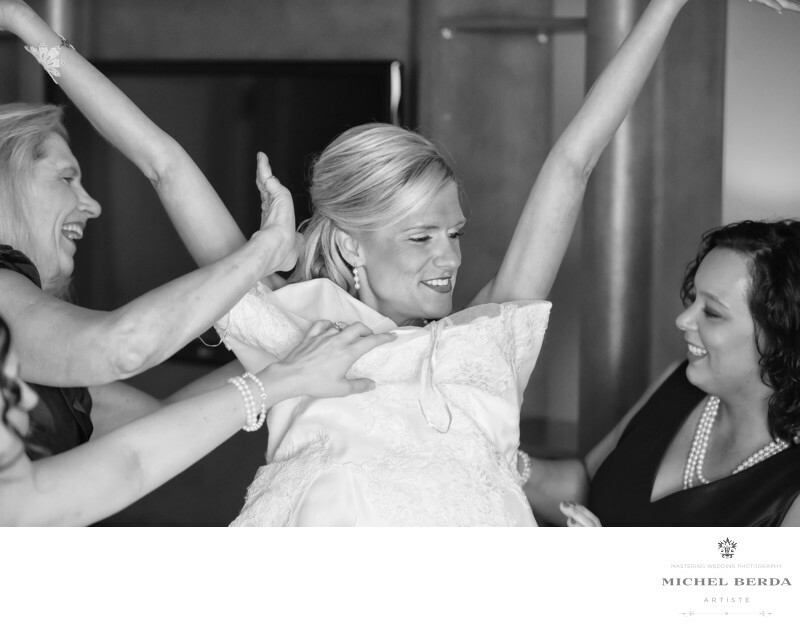 Weddings are so much fun, they are the happiest time between two people, family and friends. I have a huge passion for my art and I take my craft very seriously, when clients give me the honor of capturing their magical day, I am always ready to do just that. Some of my favorite images to capture during the day are the details and bride getting ready, usually when the bride puts on her dress, I leave the room and come back to capture it. In this case at the bridal suite of the Westin Resort & Spa, in Hilton Head, Sc, the bride wanted that moment captured when her head was peaking threw the dress, and while I could of photographed this on a high angle I found this angle way more interesting by including mom and the bridesmaids. The emotion plays perfectly in this image, the brides arms extended add to the composition, and the black and white affect is just what this wedding photograph needed in this beautiful bridal suite of The Westin Resort & Spa, In Hilton Head, Sc. Keywords: Destination Wedding Photographer (117), Hilton Head (75), sc (309), south carolina (24), The Westin Resort & Spa HHI (27), The Westin Resort & Spa in HHI Weddings (27), Wedding photographer In Hilton Head (66), Wedding Photographers (198), Weddings (168).